Born to run, the 202 Spyder Mille Miglia was a competition car built by Cisitalia for the 1947 Mille Miglia. But let's take a step back. Cisitalia (Compagnia Industriale Sportiva Italia) was founded to manufacture sports equipment in 1939 by Piero Dusio, a Turinese textile industrialist who made a fortune making military uniforms during WWII and was even the Juventus team president in late 40s. An experienced amateur driver, Dusio used his fortune and transformed his passion for motorsports into his core business. After winning his class on the 1937 Mille Miglia, he began to explore the possibilities of building his own racing cars. The Cisitalia, once a bicycle factory, became the gathering point for some of the most important figures in the automobile world, people like Giacosa, Taruffi, Porsche, Nuvolari. The first Cisitalia car built was the D46 single-seater, a true racer designed by Dante Giacosa. The mechanics was quite conservative, but the car had its ace in the lightweight and stiffness of a tubular steel space frame. Driven by Piero Dusio himself, the winning debut of the D46 was stunning. In 1947 the 202 model, the first sport-touring Cisitalia, born out of the D46, as previewed from the beginning. The early ideas have been sketched by Giacosa, but the father of the the 202 was the former Fiat aircraft engineer Giovanni Savonuzzi. With the collaboration of Alberto Vignale before and Battista Farina, later, for the body design, the car became immediately an icon. Dusio, enthusiastic and grateful, rewarded Vignale in such a way that he was able to create his own factory: the Carrozzeria Vignale while, in 1951, the coupè by Battista (Pinin) Farina was exhibited at the Museum of Modern Art in New York as a “sculpture in motion”. The 202 racing versions, the 202 Coupé Mille Miglia (CMM) and the 202 Spyder Mille Miglia (SMM), had the same space frame and the same FIAT 1100 derivated engine. Any effort was focused on lightness and aerodynamics: the body of the Spyder, designed by Savonuzzi in the wind tunnel of the Turin Polytechnic was created by Alfredo Vignale and the result was a car of just 730 kg. Smooth enough to reach over 170km/h and light enough to brake on 4 thin drums. 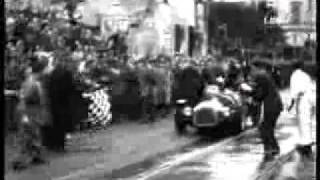 Tazio Nuvolari that was the number one driver of the 202 SMM for the 1947 Mille Miglia, emphasized the lack of engine power, but was confident that he could win. And he almost did it, arriving 2nd despite his ill health and an electrical failure, behind the Biondetti’s powerful Alfa Romeo. However, the 202 was the moral winner in that year: three official cars placed 2nd, 3rd and 4th overall and 1st, 2nd and 3rd in 1100 Sport Internazionale Class. After Nuvolari epic effort, subsequent competition spiders were dubbed 202 SMM Nuvolari, with the consent of Nuvolari himself. 1947 Cisitalia 202 Spyder Sport Special, chassis 002S, in a sense should not be called "Nuvolari", to be fair: the story of this car began earlier. 002S is a prototype, a one-off built by Carrozzeria Garella in Turin. The car is the one pictured by Millanta on the very Cisitalia brochure at the time. It has the two little aero screens and the rear fenders with high fins and spats as other ones, but has some different features which made it unique from its sister cars: the shorter doors, as the most important difference, and other details like the molding that runs through the hood until the badge, just over the grille. 002S is supposed to be the only steel built, instead of light aluminum ones. The debut of the 002S was at the “Sassi-Superga” hillclimb on May 15, 1947, driven by Piero Dusio himself who ranked 3rd. At the Mille Miglia, the same year, the Cisitalia fielded five cars including the SMM, chassis 002S, entry n°172, driven by Eugenio Minetti-Piero Facetti (the future reknown racing cars and parts specialist, father of the driver Carlo). As told, the winner was Biondetti on Alfa Romeo, while Nuvolari was 2nd with his SMM. The Spyder Mille Miglia 002S ranked 4th overall, 3rd in class and won the prize "Targa Affer" offered by the Comune di Milano to the first classified Milan crew. After being retired from the works team, the car’s original 010 racing engine was replaced by unit 029 which is still in its place.